Landscapers! Take a peek at our brand new mulch blower! The Finn BB200 has arrived! 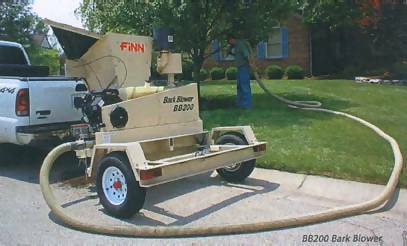 The BB200 Bark Blower is perfect for the small mulching projects such as residential and commercial mulch beds and hard to reach areas. With its 6.5 cubic feet hopper, the operator can deliver up to 8 cubic yards of mulch per hour! With the versatile BB200 you can do professional quality mulching, slopes, erosion control, overseeding, soil/compost, aggregate installation, salt/sand spreading and a number of other profitable applications. Mulch can be applied on virtually any terrain, even in wet conditions.